Assign your ingredients to the Group. Filter your searches by inclusion or exclusion of the Groups. 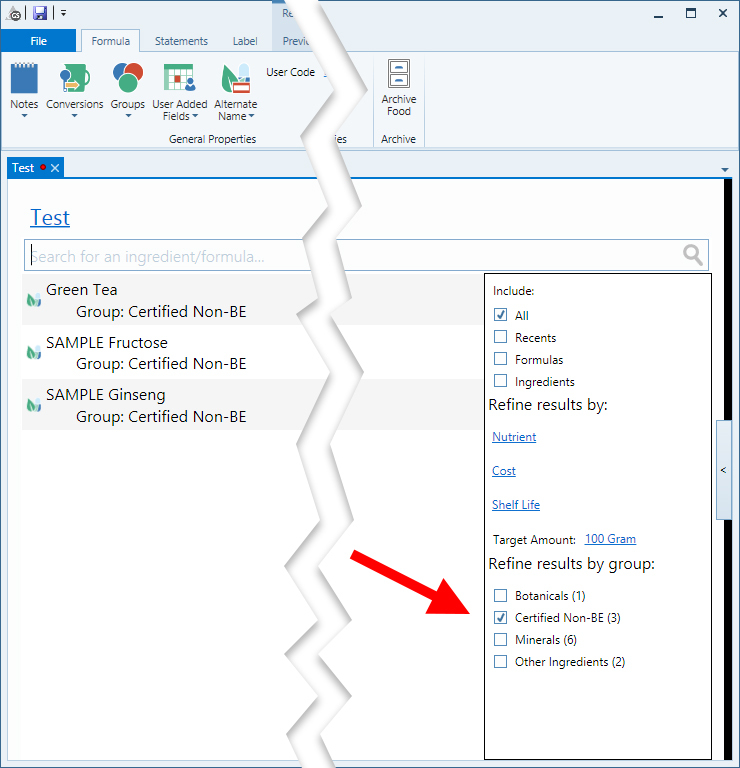 Then, you can create a new formula Group for all formulas that contain only certified non-BE ingredients. In the same manner, you could create other Groups for similar purposes. Perhaps “Under Review” or “Pending Certification” or “Needs BE seal.” Whatever is most helpful. Any Groups an ingredient or formula belongs to will show up on that record’s report. Some food retail businesses and certification bodies (Oregon Tilth is one example) use the “Organic” umbrella to include any non-BE items. If this is true for you, the Organic Properties feature may be useful. 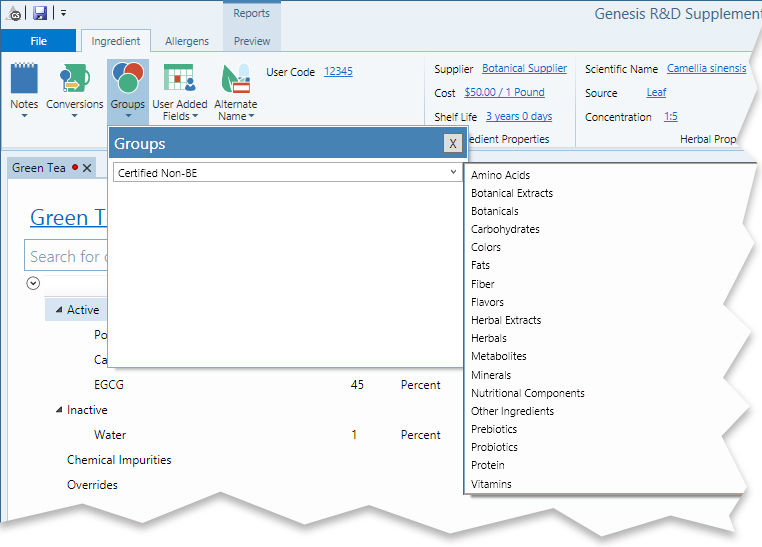 You can enter an organic percentage at the Ingredient level, and set target organic percent amounts at the Formula level. The program will automatically calculate the total Organic Percentage and indicate that at the bottom of your screen. If the target amount is met or exceeded, the percent will appear in green. If not, the percent will be shown in red. 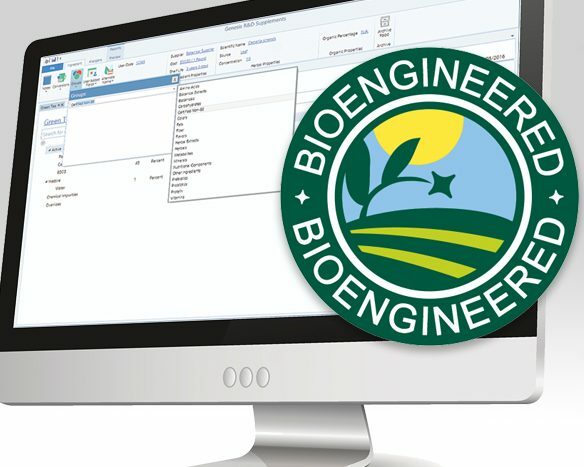 Use this data to help you decide whether to reformulate your food or to label it as bioengineered. We will keep you updated as more information becomes available. Please continue to watch this blog space or subscribe to our newsletter.